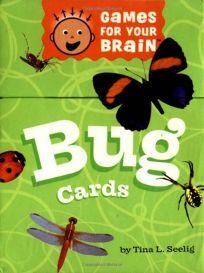 The Games for Your Brain series adds two titles: Bug Cards by Tina Seelig and Dinosaur Cards by Seelig, illus. by Robert Walters. Combining learning and fun, each box of cards contains information about its subject matter, as well as a variety of games that can be played with the cards, including ""Bug Rummy"" (similar to Gin Rummy) and Extinction (a riff on Concentration). Each set of game instructions is clearly marked with an appropriate age level and the number of players required.